The fungus works its way up through the plant's roots, clogging water-conducting tissue in the stem. This then prevents water from reaching branches and leaves, starving the plant. 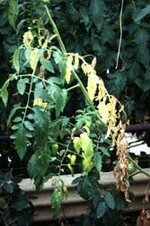 Affected plants produce very few tomatoes and often the entire plant dies. 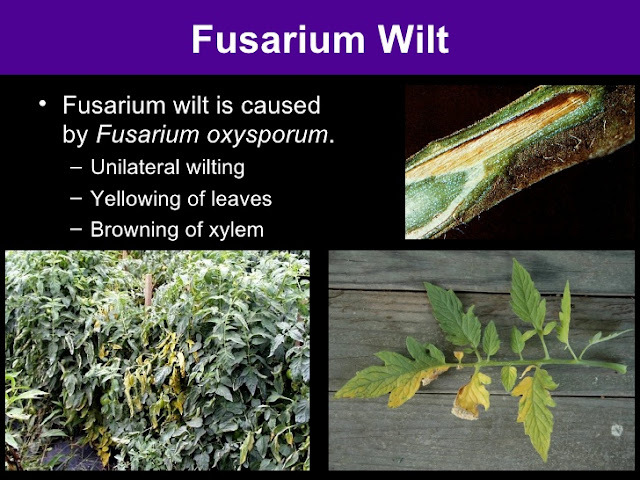 Fusarium wilt begins with yellowing on the bottom leaves and works its way up the vine. Plants generally have brown or black lesions on the lower stem and upper parts of the roots. In tomatoes, seedlings show a downward curling of the oldest leaves. To confirm infection, split open the stems. If they reveal pink to brown discolouration, fusarium wilt is present. When planting, avoid all wet spots and build raised beds if your drainage is less than ideal. Maintain a pH of 6.5-6.8 (unfavourable for the disease) and use a nitrate-based nitrogen fertiliser rather than an ammonia-based nitrogen one. Keep young plants growing vigorously and take care not to damage their roots or leaves when transplanting AND practice crop rotation! The fusarium fungus can survive indefinitely in the soil. Plant tomatoes no more than once every four years in the same spot. Avoid planting other Solanaceous crops (potato, peppers and eggplant) in the same area as they are susceptible to the fungus too. Pull up and discard infected plants immediately. If you grow your own plants from seed it is imperative that all plant growing equipment and supplies are thoroughly washed using a 10% chlorine bleach solution and use sterile soil-less seed raising material. David Jones from The Australian National University is working on the molecular basis of disease and disease resistance in tomatoes - in particular leaf mould and fusarium wilt. This disease is a very serious one, especially for commercial field growers and igloo or tunnel producers of tomatoes. We home gardeners have to do our bit too by responsibly disposing of any affected plant material in our green bins.